After faithfully serving as a church, the Century Memorial Chapel inspired preservationists. 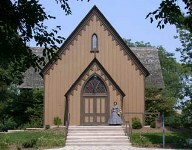 Naperville’s Episcopalians held their first religious services in borrowed space on November 16, 1838. After years of planning and fundraising, the congregation built St. John’s Episcopal Church in 1864. The flock of 350 soon outgrew this Gothic Revival structure. 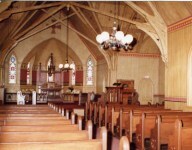 They doubled the church’s capacity by adding a wider middle section during the 1870s. The congregation worshipped in the building until the late 1960s. In 1969 a group of concerned Naperville residents rescued the church, which was threatened with demolition by new development. They formed the Naperville Heritage Society, raising money to move the church to land owned by the City of Naperville. The church was deconsecrated and its name changed to Century Memorial Chapel to commemorate its historic place in the community. The successful relocation of the Chapel to this site sparked awareness of historic preservation in Naperville and formed the cornerstone of Naper Settlement. The Century Memorial Chapel was built in 1864 by the congregation of St. John’s Episcopal Church in the Gothic Revival style, a design movement inspired by medieval European architecture. 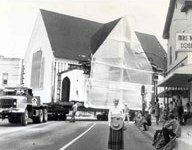 In 1970 the Chapel was moved from Jefferson Avenue and Ellsworth Street to Naper Settlement. The determination, vision and spirit of volunteers and donors to preserve Naperville's historic landmarks are embodied in the successful relocation of this building. The ability to garner resources, energize the volunteer spirit and cement partnerships was established with the effort of preserving Century Memorial Chapel. These keystones of collaboration remain the hallmark of the Naperville Heritage Society as it continues its historical preservation work for future generations.